On Linux download either OpenFOAM® 3.0.1, v3.0+, 4.0, 4.1, 5.0, v1606+, v1612+, 1706 or 1712 and compile them from source. Now click on the logo in the lower left hand corner and configure the installation. This mainly consists of telling MantiumFlow where to find OpenFOAM®.Alternatively the configuration file can be found in the MantiumFlow_default_settings folder. Using a text editor the default_settings.ini can then be modified. Make sure that your BIOS/EFI has virtualization enabled. If the output indicates a version above 2.0 you are fine. If not, please update PowerShell. It is advisable to de-install Git, Docker, older OF versions if present. Now execute the downloaded OF version and run the installation. After that finished, open up the Oracle VM Virtual Box. Select the "default" virtual machine and access the settings by clicking the yellow gear symbol. Increase the amount of RAM. 16GB should be the minimum but keep enough free RAM for the Windows host. Increase the amount of CPUs that can be used. MantiumFlow needs a minimum of 2. Before you start OF the first time, please right click on the "OF_Env_Create" icon on your desktop and run it as administrator. Please only do this once. Now you can click OpenFOAM_Start from the desktop and launch OF the first time. Unpack the zip of MantiumFlow. 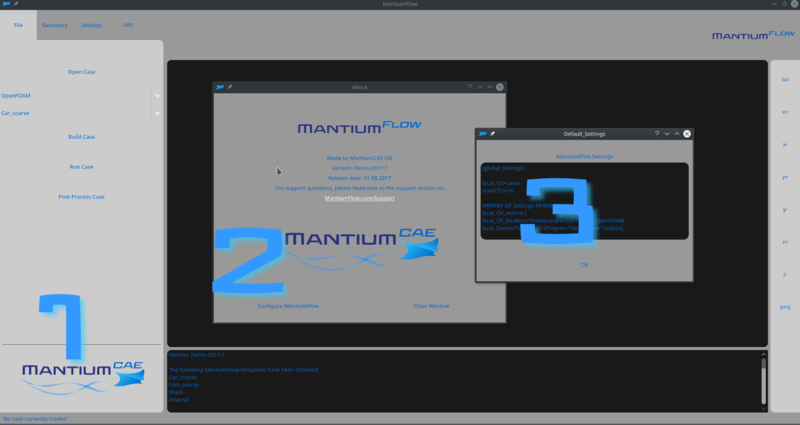 Open up the GUI by executing MantiumFlow. Now click on the logo in the lower left hand corner and configure the installation. This mainly consists of telling MantiumFlow where to find OpenFOAM and which version you are using. If you are using the blueCFD version please call the version "5.0" for blueCFD 2017-2 or "4.1" for blueCFD 2016-2. Alternatively the configuration file can be found in the MantiumFlow_default_settings folder. Using a text editor the default_settings.ini can then be modified.